Keep Helping The Performing Arts! Thanks to the help of a lot of volunteers, we were able to replace the 57 year old seats of the Royal Oak High School Kimball Auditorium. But our work isn't done. Now we offer the opportunity for you to help fund the Band, Choir, Drama Club and Orchestra programs at Royal Oak Schools. 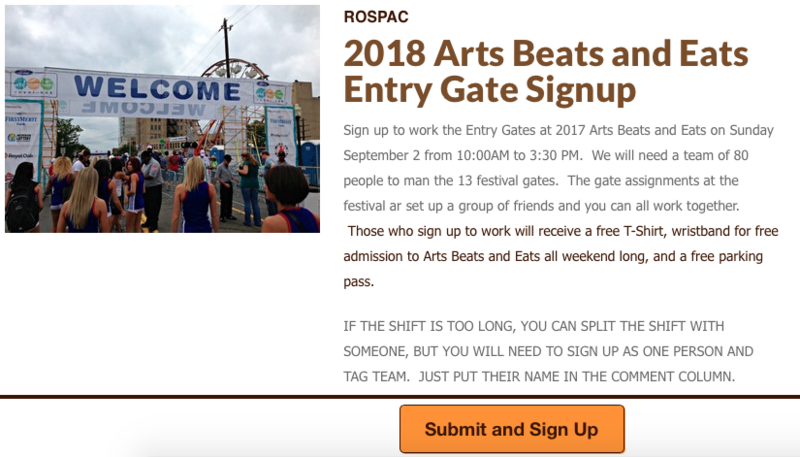 Just sign up for a shift at Arts Beats and Eats over Labor Day Weekend 2018 and you will get a free tee-shirt and a 4 day free pass wristband to Arts Beats and Eats. So you can see some performing arts while you help FUND the performing arts. Just click on one of the two links below to give us a hand. We've been very lucky to have the seats installed before all the money was raised. Make no mistake, we will have to come up with the additional $13K but if we just work hard at Arts Beats and Eats, we will reach our goal in time for the new year. Click here to see some of the pictures of the new seats being installed! We thank Royal Oak Tribune reporter Mike McConnell for this great update which appeared in the Tribune on June 7th, 2016. A group of Royal Oak parents isn’t sitting still as they close in on raising $100,000 to replace the nearly 60-year-old seats in the Royal Oak High School auditorium where students perform. ROSPAC still has a great deal of momentum in our goal of raising $100,000 by the end of the school year to replace the aging seats of the Royal Oak High School auditorium. Former ROHS Student Theren Williams produced a series of 4 short videos to urge viewers to donate to help replace the 57 year old seats at Royal Oak High School Auditorium. Watch these and share them with your friends and family. Lots of activity happening with the Royal Oak Schools Performing Arts Committee and we need your involvement. Auditorium Update: JUNE 29, 2016 -- The seats have been removed and work is taking place on the electrical, lighting and sound installations. ADA Wheelchair platforms have been cut into the floor and the ceiling and walls are being prepared for paint. Name On A Seat: I know many of you have been saying “I really want to have my name on that plaque”. Time is running out. We haven’t reached our goal yet ($65K of $100) and soon construction will begin. The plaque design is ready and we want to get all of the names we can on it. We need your help to get donations moving. Post links to the article in the Royal Oak Tribune. We will send out this reminder about once a month until we get all of the funds needed to replace the seats. Thanks you for your efforts so far!